Well it’s Geography Awareness Week 2016 – and more specifically Day of Geography. This is the day where we encourage geographers, geospatial professionals, environmental professionals and anyone that uses geography in their occupation or career to blog about their workday. For those that don’t know, my name is Darren Platakis. I’m the founder of Geospatial Niagara and the creator of Day of Geography (with inspiration from Day of Archaeology). 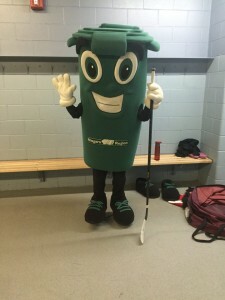 I also work in the Long Range Community Planning department of Planning and Development for the Regional Municipality of Niagara. I may be a sort of anomaly in that my Day of Geography usually consists of many different things. I generally try and make it out to several schools during Geography Awareness week to promote the discipline as well as potential careers. 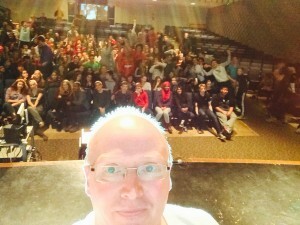 Today I visited Saint Michael Catholic High School in Niagara Falls, Ontario and spoke with a Grade 10 Civics class. These types of visits are always fun and truth be told, are what I live for especially in my work with Geospatial Niagara. I strongly encourage anyone, regardless of their career to give back to students. Go into your old high school and share your experiences. Teachers are always looking for resources to bring into the class room whether it’s a website, a document etc. But the greatest resources that they can draw on are real people, with real experiences that can be shared. applications that need to be input into iDARTS – Interactive Development Application Retrival and Tracking System. My position entails geo-referencing Development Applications that come into the Region through the 12 lower tier municipalities. A map of the Niagara Region appears below that illustrates the municipalities of the Niagara Region. The applications are numerous and cover everything from Consent and Condominium applications to Servicing and Zoning By-law amendment applications. Each of these need to be geo-referenced so that the planners that are responsible for the applications can readily see where the applications are located. These planners also use an internal web-based mapping application called Niagara Atlas to do their work in terms of providing comments regarding the application. They investigate such things as are there wetlands present near the application, what will be the impact of increased traffic, is there adequate services available? There are any number of questions that a planner needs to address before a decision is made with any application. Personally I am not a planner, but I assist them by attaching the applications to the parcels of land where they are located. 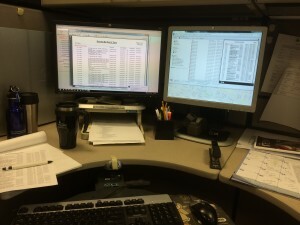 I’m also responsible for the mapping and maintaining of the Building Permit information that comes into the Region on a monthly basis. This helps us to track where new growth is occurring and allows us to begin to visualize the growth of the region. We receive information in the form of .xls or .csv files and sometimes as .pdf’s which can be frustrating. We aggregate this data and generate statistics that help inform the decision making process. Later this week, on GIS Day, Wednesday, November 16, I will be visiting St. Paul Catholic High School (website under construction) again to present to a class on careers in Geography focusing on the use of GIS software. Thursday has me meeting with the Mayor of St. Catharines, Ontario with respect to a Geospatial Niagara project called treeOCode Niagara. This project is community engagement initiative that promotes the value of the urban forest. The project uses either Open Data or crowd-sourced data to capture the locations of trees. If the species and the diameter of tree is known then the eco-benefits of that tree can be calculated. As it currently stands, the almost 20,000 trees that are currently in the treeOcode database provide nearly $1.3 million in benefits to the community. 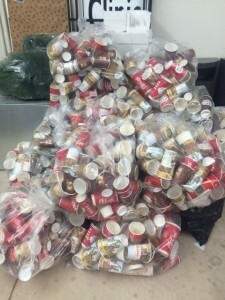 The bulk of the trees currently in the database are in the Municipality of St. Catharines but there are some from the Town of Niagara on the Lake as well. 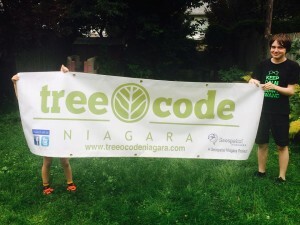 The meeting on Thursday is to provide information to the city about treeOcode Niagara with the hopes that we can engage more people about the benefits of the urban forest canopy. All in all, my career in Geography varies. It is that variety that I like. Next year I may be speaking with a Grade 3 class for Day of Geography or trying to put together a presentation for GIS Day 2017. Who knows? But what I do know is that I am passionate about geography and equally passionate about promoting geo-literacy to students across Niagara and, through Day of Geography, around the world. Visit Day of Geography, Geospatial Niagara or treeOcode Niagara on Facebook. Find out more about the Niagara Region. Please spread the word about Day of Geography – Share YOUR story. I can’t begin to describe how happy I am that more people continue to contribute to the Day of Geography site. It’s a labour of love and a bit of a challenge to put this all together but the amount of information that students around the world can access continues to grow. My day this year begins at my “day job” as a Planning and GIS Data Administrator at the Niagara Region in the Long Range Planning Department of the Planning and Development Services Division. While there I’m responsible for the maintenance and updates of the iDARTS program. That is, the interactive development application retrieval and tracking system. Basically it’s a GIS that attaches planning applications to the parcel(s) of land they apply to. These can include Official Plan amendments, Zoning Bylaw applications, Subdivision/Condominium applications among others. This is not all I do however, I’m also the Founder and Executive Director of Geospatial Niagara and the caretaker as it were of this here “Day of Geography” initiative along with some other volunteers of Geospatial Niagara – namely Ashley and Matt. This year, my day with Geospatial Niagara consisted of taking part in a panel discussion called Community Connects for the Brock University Co-op program. This particular panel is about careers in geography, developing interview skills, networking skills and in general promoting the geospatial technologies and information sector, especially as it relates to the growing sector in Niagara. After the presentation, I need to return to work and pick up where I left off. In the evening, I need to put the finishing touches on my presentation to a class of Grade 10 students at Sir Winston Secondary School in St. Catharines. The organization Business Education Council of Niagara has a program that receives requests from teachers throughout Niagara for people and organizations to participate in discussions with high school students about career/educational opportunities. No surprise, I’m doing a talk about careers in Geography. It’ll be a year to the day, since the last time I was there (incidentally on Day of Geography 2014). I’m sure there will be students that remember last years presentation! Wednesday is GIS Day! Time to head over to Brock University to watch the ESRI scholarship presentations! 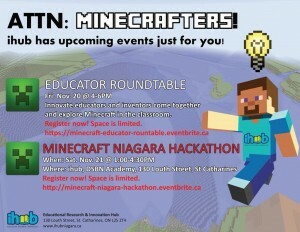 On Wednesday evening, work continues to finalize discussion ideas for the Niagara Minecraft Project Educator Roundtable discussion on November 20 and the Niagara Minecraft student hackathon on November 21. The Niagara Minecraft Project began as a thesis project in the Niagara College GIS and Geospatial Management Program in the 2014-15 school year. The goal was to convert Niagara Region geospatial data (roads, hydrology and topography) into a 1:1 scale Minecraft map similar to those completed in England and Denmark. It was one of three projects sponsored by Geospatial Niagara. Recently due to the exposure that this project has garnered, Geospatial Niagara became part of ihub – Niagara’s Educational Research and Innovation hub as a portfolio company. This greatly increases our visibility and provides greater access to the schools that make up the District School Board of Niagara. The two events being held as part of the Niagara Minecraft Project will help us to engage those teachers that want to utilize Minecraft in their classrooms to provide their curriculum, and on the following day, allow kids to have fun and experiment with the full Niagara region Minecraft Map. My work with Geospatial Niagara is a passion that I cannot put into words. I have a vision for what it can be and over the last two years, we’ve slowly built towards that vision bringing more volunteers into the fold. In 2014, we spoke with over 650 students ranging from Grades 2 all the way to Masters students. This year we’re on target to present to over 1000 people. We have six student projects on the go this year – three of them are at Niagara College – The Niagara Minecraft 2.0 project, the Lincoln & Welland Regiment Interactive Geospatial Visualization project and the Niagara Hops Farm Site Suitability project and three of them are through the Brock University Honours Internship program. These include the Niagara Aspiring Geoparks Economic Study, an Active Transportation Mapping study and a Niagara Geographic Education study. 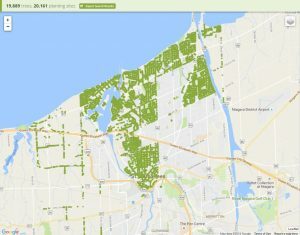 Our treeOcode Niagara project really took off this year receiving a grant back in May from Evergreen that helped us out immensely. We’ve recently also started working with a community group to provide them geospatial services and consulting, this brings us out further into the community which is another mission of ours, promoting community participation through geography. Studying geography opens your eyes to just how big yet how interdependent everything in our world is. Geography as a discipline has never been more important than it is right now. Most challenges we face in 2015-16 and far into the future, revolve around Geography. Working for or creating your own business no matter if it’s for profit or not for profit is incredibly rewarding – doing it as a geographer seems to make it even more fulfilling. HAPPY DAY OF GEOGRAPHY EVERYONE!! Hope you’ve had an excellent GIS Day as well. Thank you to all who participated this year. Well today is the day!!! Day of Geography! The first one ever and definitely not the last. Geospatial Niagara created Day of Geography but was inspired by the Archaeological community’s “Day of Archaeology“. The story of why, how, when can be found in the “About the Project” section. 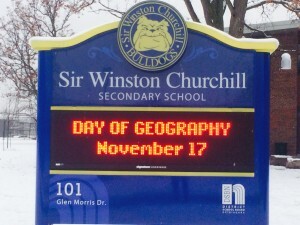 Today was a special day because myself and six other colleagues had the fortune of making a presentation to approximately 100+ Grade 9 Geography students at a local high school – Sir Winston Churchill. Joining me on stage were Jean Tong – Director of K-12 Education at ESRI Canada, Kevin Turner – Physical Geography Professor at Brock University, Colleen Beard – Head of the Map, Data & GIS Library at Brock University, Teresa Alonzi and Amber-Lynn Schmucker from the Brock University Geographical Society and Janet Finlay – Program Coordinator of the Niagara College GIS and Geospatial Management Program. I am aware that there was another high school Day of Geography event and that was in Waterloo at the Waterloo Collegiate Institute being put on by my colleague Dr. Amanda Hooykaas. The presentation began with a Jean Tong walking about what resources the students could access immediately and showed examples of various types of story maps. Thus began a journey through their education from high school through to university and post secondary education. Next up came Kevin talking about some of the course offerings at Brock University and about his own research pertaining to climate change and its impacts in the Far North. Colleen Beard guided the students through the Map, Data and GIS library site, illustrating some of the student created maps as well as the excellent War of 1812 Google Maps Presentation. Teresa Alonzi and Amber-Lynn Schmucker, both from the Brock University Geographical Society (BUGS) talked about their experiences in the geography program. Interestingly enough neither of them began with geography at Brock, they found geography and switched their majors. They had found their calling. Janet Finlay from Niagara College talked to the students about the GIS/Geospatial Management Program and about all the work (and the rewards) that entails. The presentation wrapped up with me discussing Geospatial Niagara. What we’re all about, out vision, mission and goals. We wrapped up with a little bit of a question period from the students which included one of my favourite questions to answer. “Why did you choose geography?”…. For me, I had some amazing teachers all the way through grade school to high school and university/college. In the long run I don’t think I chose geography. Geography chose me. But the educators that I had refined my vision and increased my passion for the subject to areas I had no idea about. And now the planning begins for Day of Geography 2015 – November 16, 2015 to make it bigger and better. My day started typically enough, viagra with turning my computer on, try reviewing my email and voice mail. 2. Mapping – I use Niagara Navigator (municipal version) daily as it helps me look up a property to see it from a Google Earth perspective. Zoning and Official Plan data are included as layers, which helps me answer questions faster than otherwise. 2. Canadian Institute of Planners (CIP) teleconference: I am a volunteer member of the newly formed National Initiatives Advisory Committee. Our first telecon is this afternoon. I have to review the agenda and meeting materials in preparation for the meeting. 3. Township Zoning By-law: Our new Comprehensive Zoning Bylaw became officially in force last Wednesday. Dealing with the public has identified some typos, errors and omissions etc that need to be resolved. I have started to track these issues, in order to resolve them later this year, or early in 2015. 4. Customer Service: On-going phone calls, walk-ins and other inquiries. 5. Committee of Adjustment Applications for December 2014 hearing: We have received 2 applications that need to be processed. This involves ensuring that both are deemed “Complete” per the Planning Act, that both have Notice of Hearings drafted, and that both are circulated to the appropriate agencies (checklist used to confirm this). 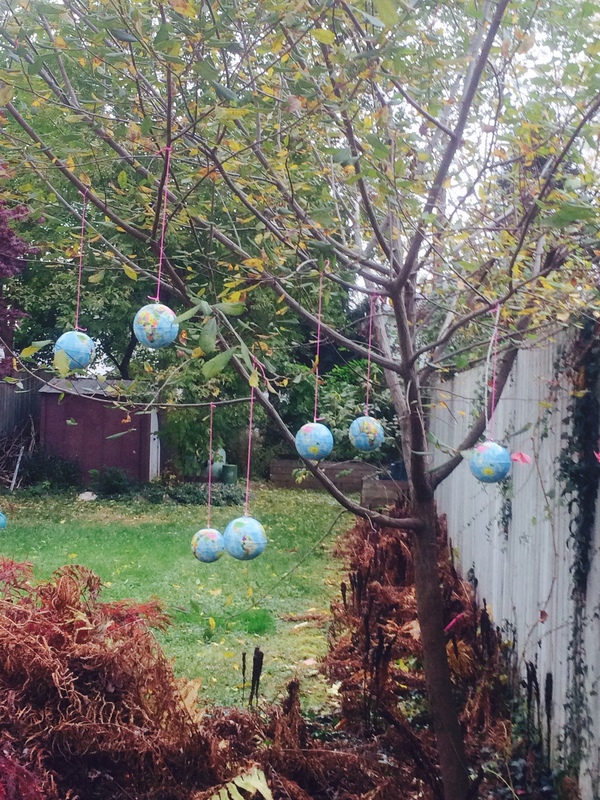 Day of Geography is Almost Here! Hello World!! This is usually the phrase used to test a string of code. In this case, the phrase means so much more. In the context of this post, it truly is “Hello World”. As this post is being written (November 9, 2014), the Day of Geography site has had visitors from 56 countries and 291 cities. This is incredibly inspiring to me! I can imagine days where students from around the world visit the site and become inspired to become remote sensing specialists, urban planners, educators, transportation geographers, GIS analysts, surveyors….. the list goes endlessly on and on. 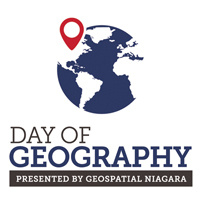 Geospatial Niagara is incredibly proud to bring you Day of Geography and we thank our supporters in this endeavour. It has been a valuable learning experience for us and we hope it provides a valuable learning experience to students, educators and citizens around the world. As Geography Awareness Week begins, let’s also remember those that inspired us to become geo-professionals. Each of us has been inspired in some way by those who have educated us. To those who have and continue to inspire me, lit the fire and keep it burning. Thank you!